September is Child Passenger Safety Month and Child Passenger Safety Week 2013 begins today. So, this couldn't be a better time for me to share with you about a new beautifully designed infant car seat product that is all about your baby's safety and comfort -- and style and convenience for you. The new Maxi-Cosi Mico AP rear-facing infant car seat suitable for babies from 5 to 22 pounds is the lightest in its class on the market today, weighing only 8.6 pounds. Maxi-Cosi and its sister brand Quinny have been favorites of trend-setting parents in Europe for years, including celebrity new moms and moms-to-be like Niki Taylor, Alicia Keys and Giselle Bundchen. 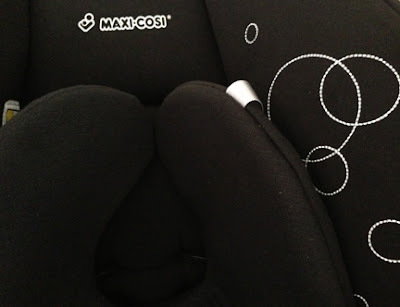 Only recently have select Maxi-Cosi car seats begun to debut here in the U.S. Yet, already they are being highly sought after by discerning pregnant and new mothers, especially urban moms who want baby car seats that are high quality and safe but also stylish too. Safety is Maxi-Cosi's number one concern -- exemplified by the brand's patented advanced Air Protect Side Impact Technology. This unique safety innovation provides the necessary cushion system and support around a baby's head, which is essential with newborns and young babies who have yet to develop the proper strength and control of their necks. 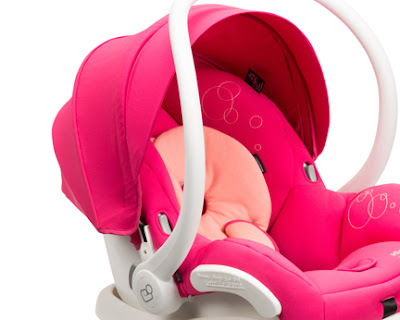 Maxi-Cosi's special Air Protect design (which is what AP stands for) doesn't only keep your infant safer. The cushioning, as well as the comfortable premium upholstery and padded 5-point harness covers together create a cozy and cocooning experience for baby while she or he is buckled in. 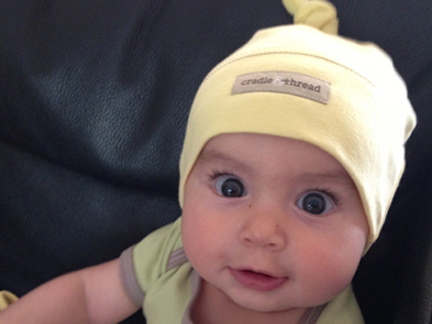 Also included is the super soft Cozi-Dozi head insert to give extra support to newborns. Yet another added feature that is a real asset is the multi-position sun canopy with flip out visor to help shield baby's sensitive skin and eyes from the sun and bright lights. Moving this infant seat in and out of the car couldn't be easier, either. While the car seat base remains secured in your car, you can easily lift the Maxi-Cosi Mico AP infant car seat out and snap it in either to a Maxi-Cosi or Quinny stroller. The icing on the cake is the ergonomically-designed handle for extra comfort while carrying your precious cargo in your hand. The Maxi-Cosi Mico AP Infant Car Seat by Maxi-Cosi, a brand of the European Dorel Juvenile Group, is currently offered in four colors. These new premium child car seats, built on the safety innovation and stunning design concepts that Maxi-Cosi brand prides itself on are available in 4 colors now, expanding in about a month to availability in a total of 14 vibrant single color and two-tone options. 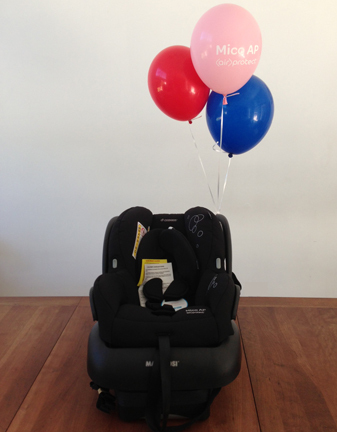 Designed for use from birth till about 12 months old, for babies from 5-22 pounds and 19-29" in height. The new infant car seat is available at Traveling Tikes and elsewhere nationwide online and instore at better baby equipment shops. Use the Maxi-Cosi store locator to find the location nearest you. Approximate retail prices for the Maxi-Cosi Mico AP are $199.99 for the black frame and $210 for the white frame. For more information visit the Maxi-Cosi site and follow them on Twitter and Facebook. The news gets even better -- the brand is providing MommyBlogExpert with one of these new Maxi-Cosi car seats in the winner's choice of color to give away to a very lucky reader! FTC Disclosure: This is a compensated post. 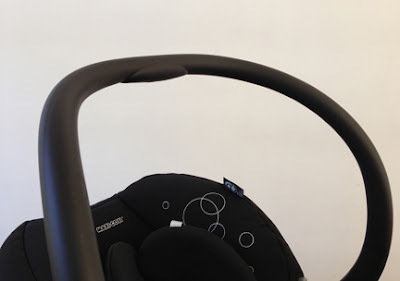 I disclose that I received a Maxi-Cosi Mico AP Infant Car Seat to facilitate this review post. 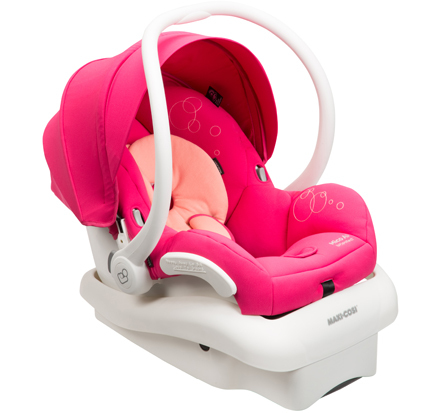 Maxi-Cosi is also providing the same product (in winner's choice of color) and shipping for the associated giveaway. However all opinions in this post are my own. See complete FTC Disclosure information that appears at the bottom of MommyBlogExpert's main page and at the bottom of every individual post on this blog, including this one.